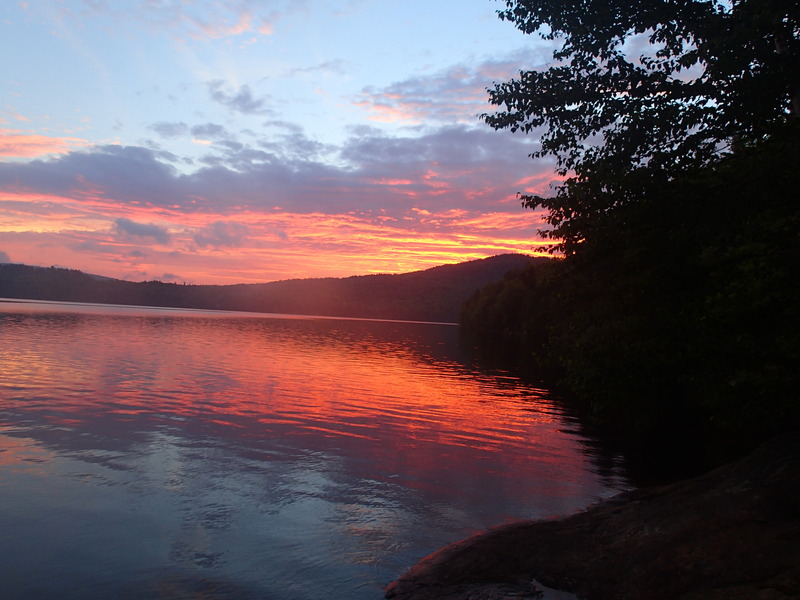 Aziscohos or Aziscoos Lake…however you say it, what a great trip! | Vermont Paddle Pups! 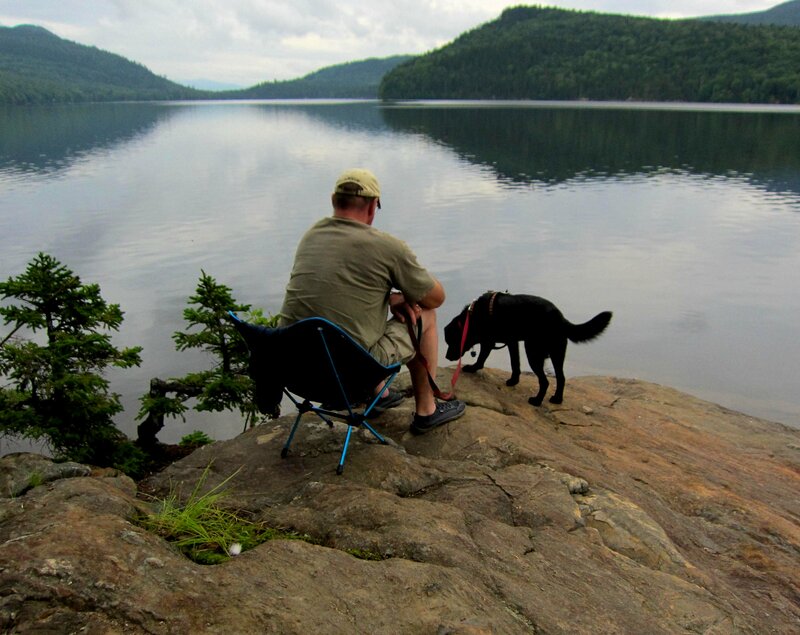 Aziscohos or Aziscoos Lake…however you say it, what a great trip! 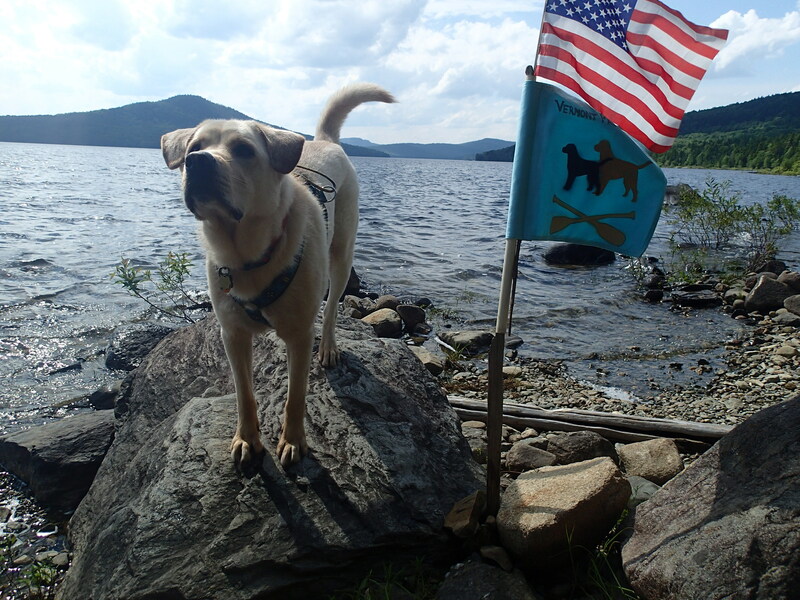 Proudly waving the US and Paddle Pups flags! We scouted this area of Maine last March, when it was 20 below zero, and covered in a deep blanket of snow. No snow this week, just sun, hot, muggy, and one morning of torrential rain. 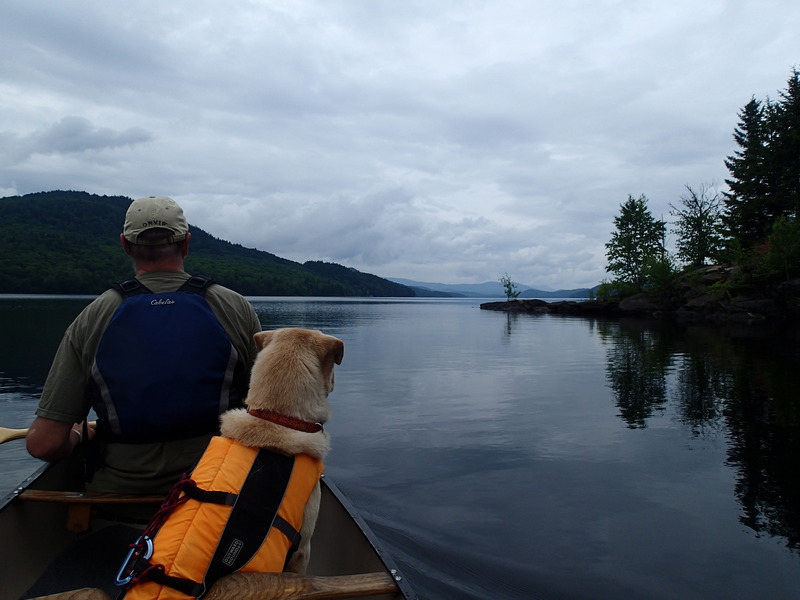 We spent the first four days on Aziscohos Lake ( also spelled Aziscoos), about 20 miles west of Rangeley, the nearest town. 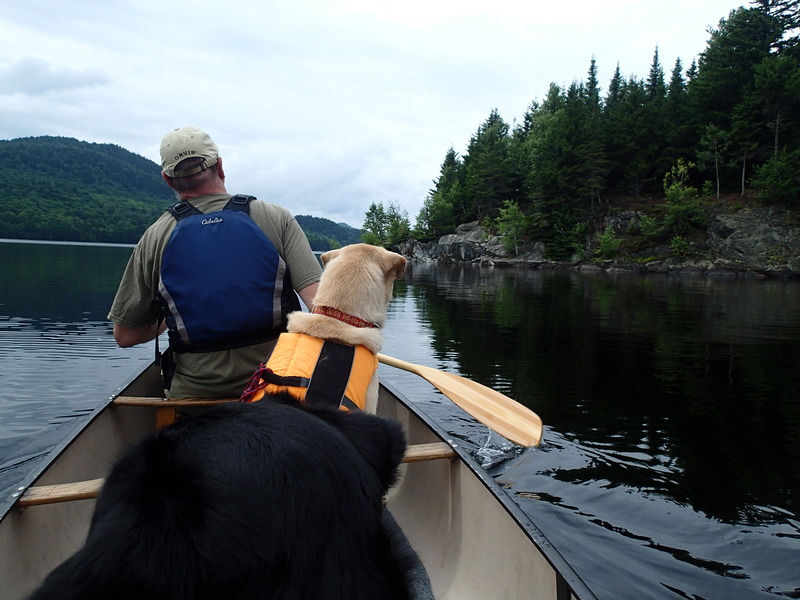 Our usual paddling waters range from 600-800 acres…Aziscohos is nearly 7000 acres—our first “big water” paddling trip. The wave and wind action of this long north/south lake made for some interesting, but quite fun paddling. The rocky shores were beautiful, and home to an abundance of wildlife. We saw the whole size spectrum of birds…from hummingbirds to bald eagles soaring over our shoreline campsites. 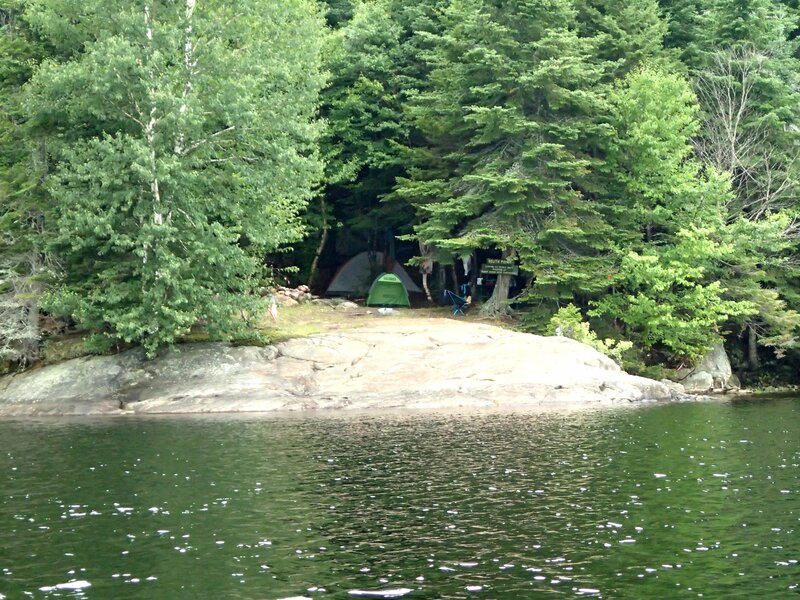 Our site, as seen from the water…. Gryphon, relaxing in the late day sun…. Miles and miles of lake…all to ourselves! We spent most of the week on Beaver Island, a 20 acre island, about 1.5 miles from the access point…no cell phone service, of course, and we had the lake mostly to ourselves. 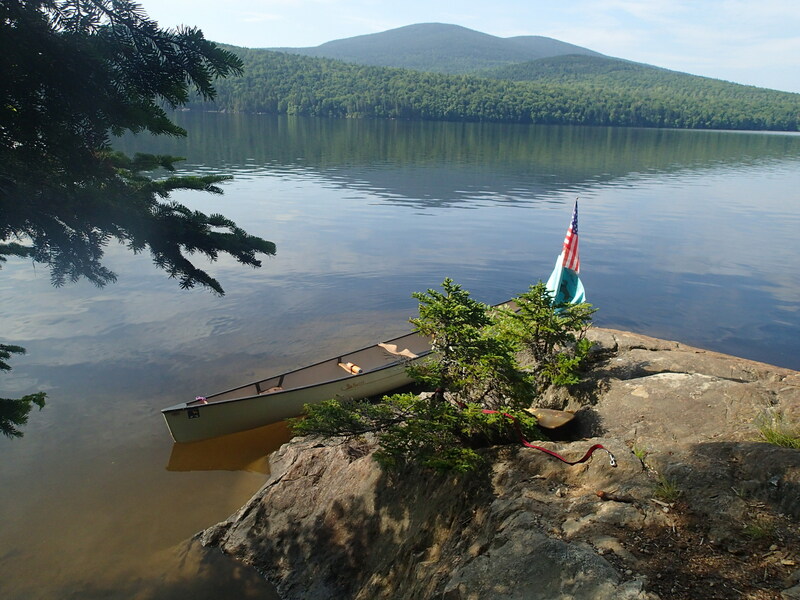 There was one other camper on the other side of the island…ironically, we met him paddling, when we think our 2 canoes were the only boats on the whole lake! In fact, during our 4 days, I think we saw 5 or 6 fishing boats, 3 kayaks, and one other canoe…that was it! 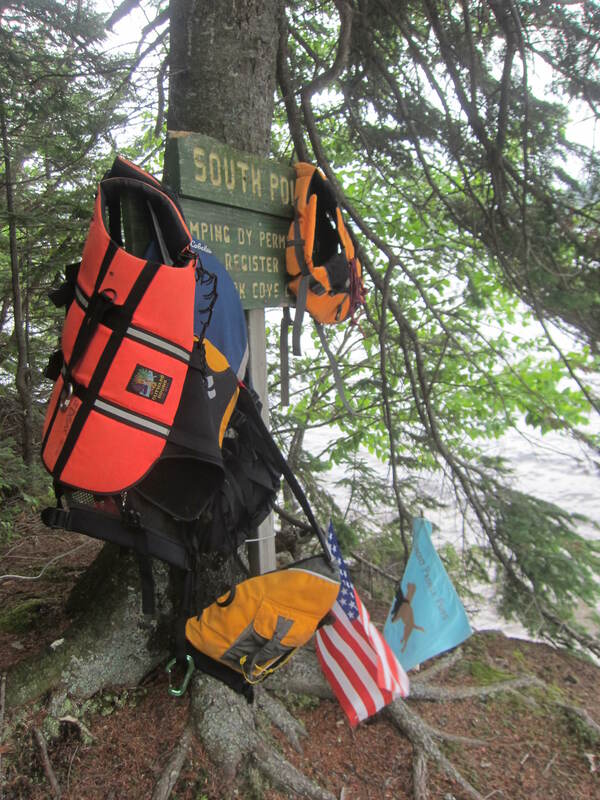 Our gear, hanging at the campsite sign…. The Swift, ready to head on out…. The dogs were unleashed, and though they could run free, they stayed close to us ( after all, we had the food!). Of course, we did have one particularly brazen red squirrel, who would run right up to the dogs and taunt them with his ch-ch-ch voice. Finally, our pups had enough, and off they went, scrambling down to the shoreline, chasing it with great loud barking exclamations. Thankfully, Gryphon responds quite well to a stern “BREAK!”, and has a great recall. Edgar, our “wild child” actually returned when called…even if it was not on the first try! After that, they had to spend a bit of time on their lines..it was getting dark, and we did not want to be chasing them over slippery rocks, roots, and hills! We had quite a rain storm arrive during one night, and the next morning we hunkered down in the tent during 4 hours of deluge. Thankfully, we had books, and the dogs were happy to sleep. By afternoon, the skies had cleared, and the lake had calmed enough for a paddle. There was quite an impressive sunset that evening, and we were able to partially dry some of the wet gear. 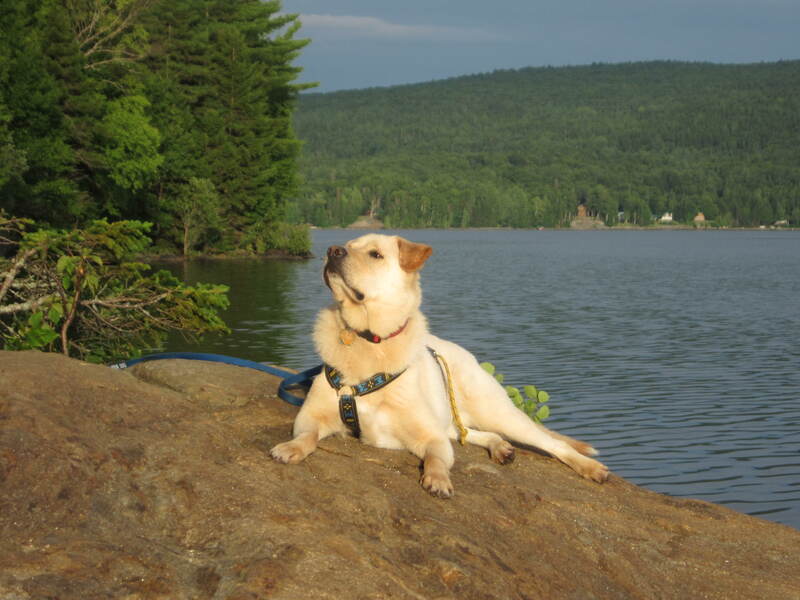 Some of us went swimming…others just relaxed on the impressive rock that jutted out from our campsite, watching the loons and eagles. 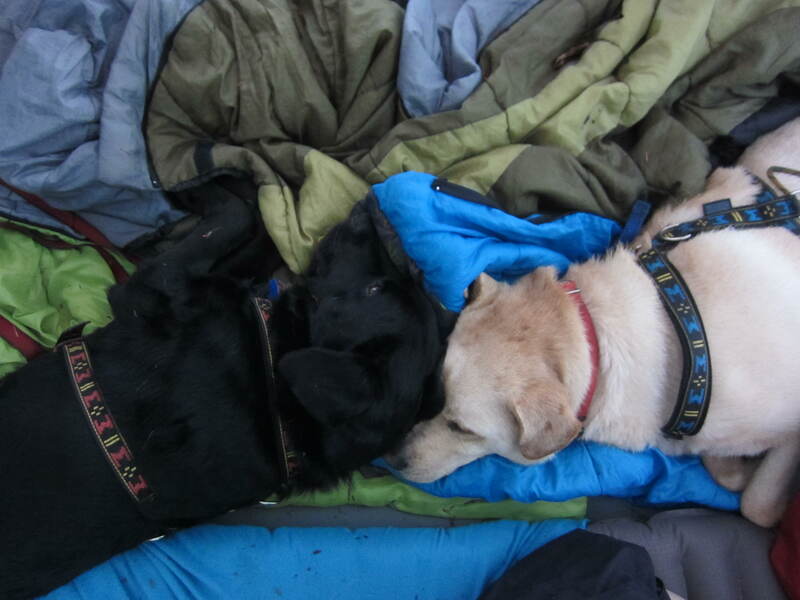 The dogs slept through most of the rain..at least we had no thunder and lightning! On Thursday, we packed up early, and paddled out….we wanted to do some hiking, especially in areas where we had been snowshoeing in March. 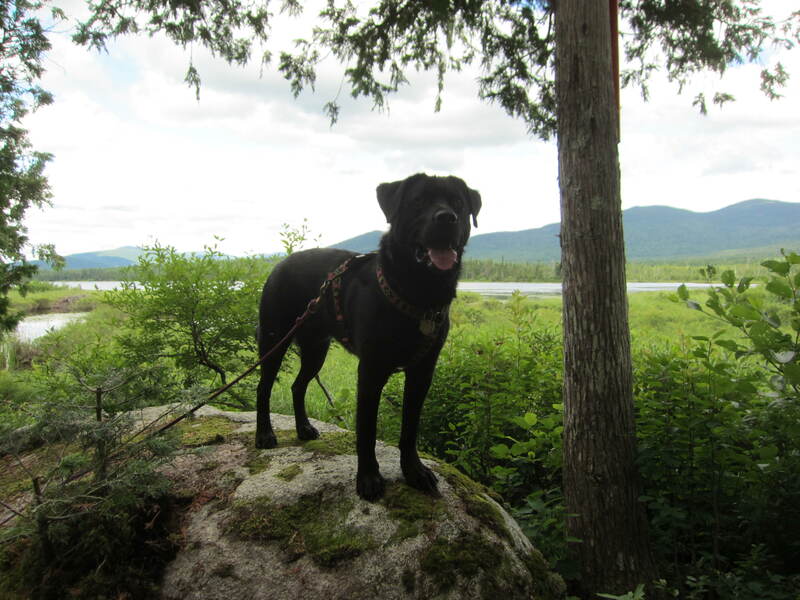 We also had reservations at a dog-friendly hotel in Rangeley, where we had stayed in March…then, we had done kicksledding right out the door, onto the frozen lake. This time, we planned to canoe, putting the boat in the water 100 feet from our door. We had 3 total hikes this trip, none too long, and we did not see any bears or moose. We did see some rather large fresh moose tracks on one trail….the dogs were very interested. 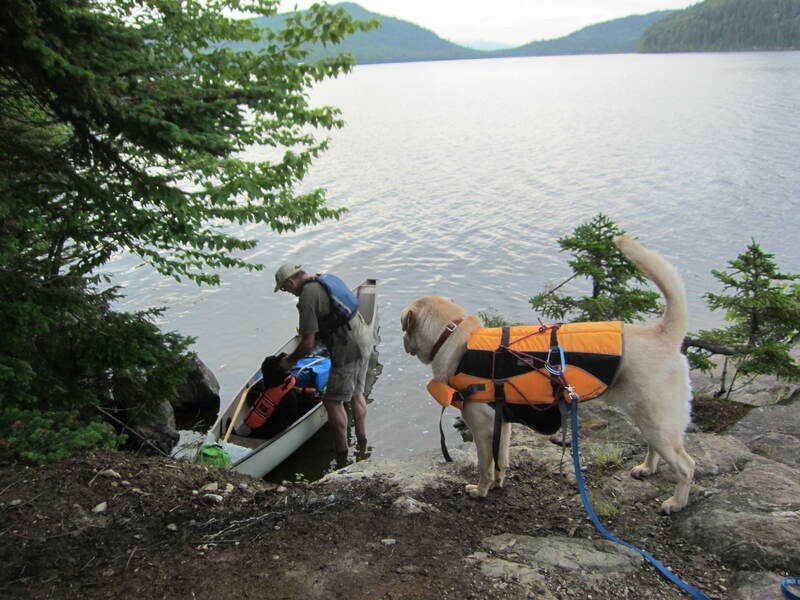 Tossing gear DOWN to the canoe to leave, was definitely easier than off-loading it up a short steep ledge! This rock was under the snow in March! 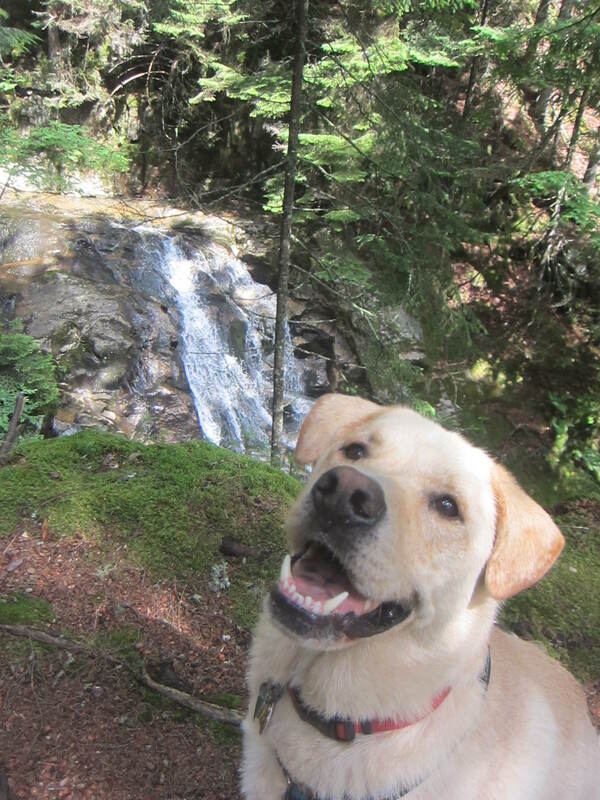 Cascade trails mean water! Happy dog! A lovely trail…though the steep sections and rocks were very slick from the rain. We decided not to climb Bald Mt., due to the wet hiking conditions. This is the exact spot we were kicksledding last march…when the lake was frozen! 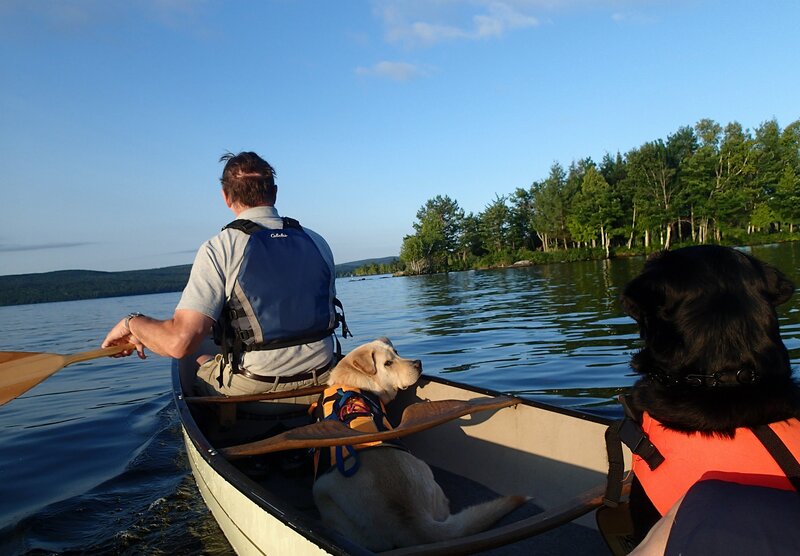 This trip was quite the experience…a few days cut-off from any communication with the outside world, 12 hours of torrential rain, much of it in a tent with 2 dogs!, challenging paddling conditions which we faced with confidence, all factors contributing to a successful vacation,. We came home healthy and safe, and looking forward to the next adventures! Love your blog. I am planning a trip with my wife to Aziscohos and want to ask for your advice on camping there. What site(s) did you stay at that are pictured in your blog? Also, I am curious about the possibility of finding a “bush” site; i.e. one that is not a commercial site and does not need a reservation. Do you know of any of those places on the lake? Did you see any while you were there? Any information would be great! We stayed at Black Brook Cove campground…we made reservations, but there were not many people when we were there ( mid-week, mid-July). We camped at the east shore site one night (can drive to them, but still remote), and then on Beaver Island for a few nights ( site 3, I think, the one with the big rock!). 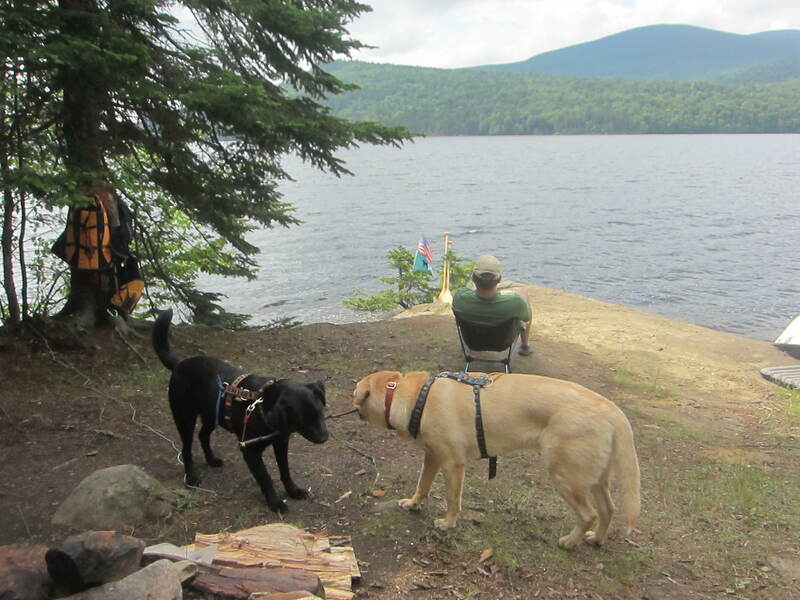 There are a few other remote campsites ( Aziscoos Lake Wilderness Camping, a different group than Black Brook, we got their brochure from Rangeley Lake chamber of commerce. )further north up the lake. 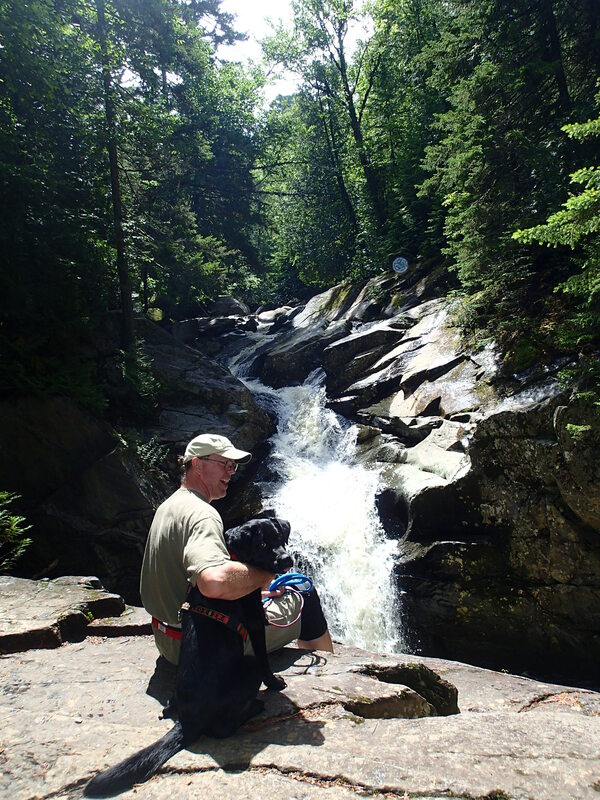 We had also looked at the remote sites on the Northern Forest Canoe Trail (non-commercial) in the Rangely area ( section 8, check the NFCT website), but decided to try Black Brook…would definitely return another time!